What is a Vickrey Auction? A Vickrey auction is a sealed-bid auction where bidders submit bids without knowing the bids of other people. However, as opposed to other sealed-bid auctions, the price paid is the second-highest bid price and not the winning bid price. The Vickrey auction was named after William Vickrey, a Canadian who won the 1996 Nobel Prize in Economics for his research on asymmetric informationAsymmetric InformationAsymmetric information is, just as the term suggests, unequal, disproportionate, or lopsided information. It is typically used in reference to some type of business deal or financial arrangement where one party possesses more, or more detailed, information than the other. in economics. In a Vickrey auction, the individual is bidding their true value and are not trying to assess what everyone else is going to bid. Therefore, in a Vickrey auction, the individual is bidding the maximum amount they are willing to pay and are not disadvantaged by it. By utilizing the second-price mechanism in a Vickrey auction, individuals bid truthfully – individuals are motivated to bid their maximum value because the individual understands that if their bid wins, they will only need to pay the second-highest bid value. For example, consider an auction for an antiqueAlternative InvestmentAn alternative investment is an investment in assets different from cash, stocks, and bonds. Alternative investments can be investments in tangible assets such as precious metals or wine. In addition, they can be investments in financial assets such as private equity, distressed securities, and hedge funds. to which an individual places a $100 value on. The individual would not post a higher bid than the maximum value ($100) he has established for the antique due to the possibility of having to pay a price higher than his maximum willingness to pay of $100. The individual would not post a lower bid than the maximum value ($100) he has established for the antique due to the possibility of losing the antique for a price less than the maximum amount the individual is willing to pay. There are six individuals involved in a Vickrey auction for an antique. Each individual bids their maximum willingness to pay for the antique, as illustrated below. Under a Vickrey auction, who will win the auction and what will the price paid for the antique? Individual A will win the auction due to his highest bid of $103. However, Individual A does not pay the highest bid price – he pays the second-highest bid price. In our example, he will only need to pay $101. Therefore, Individual A’s maximum willingness to pay is $103, and he only ends up paying $101 for the antique – a $2 surplus. Vickrey Auction: Bid Higher or Bid Lower? Bidding Higher Than Maximum Willingness to Pay? 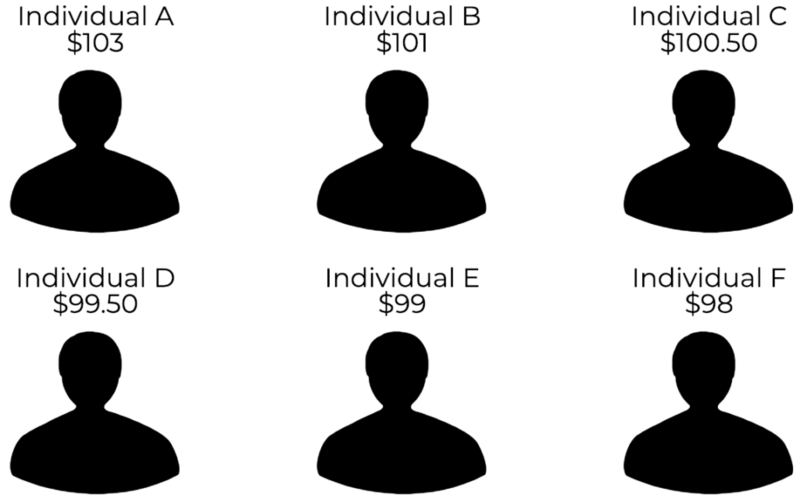 If Individual B’s maximum willingness to pay is $101, and he bids $105, he runs the risk of having to pay a higher price than his willingness to pay (this is a risk because it would only occur if the first runner-up’s bid is higher than the individual’s maximum willingness to pay). In such a case, the first runner-up will be Individual A at a price of $103 – a $2 deficit from Individual B’s maximum willingness to pay. Bidding Lower Than Maximum Willingness to Pay? If Individual A’s maximum willingness to pay is $103 and places a lowball bid of $100, he runs the risk of losing the bid at a price that the individual would’ve been willing to pay (it is a riskBusiness RiskBusiness risk refers to a threat to the company’s ability to achieve its financial goals. In business, a risk means that a company's or an organization's plans may not turn out as originally planned or that it may not meet its target. because it will only occur if another bidder places a bid that was higher than the lowball offer). In such a case, Individual B will end up winning the auction at $101 and only need to pay Individual C’s price of $100.50. If Individual A lowballs the offer, he ends up losing the bid, and the winner only needs to pay $100.50 – less than what Individual A would’ve paid. In a Vickrey auction, bidders are unaware of the bids of other individuals. The winner of the bid does not pay the winning bid price – the individual pays the second-highest bid price. In such an auction, individuals are encouraged to bid their maximum willingness to pay. In the absence of collusion, there is no incentive for an individual to bid higher or lower than their maximum willingness to pay. Forced Sale ValueForced Sale ValueA forced sale value is the estimate of the amount that a business would receive if it sold off its assets one piece at a time during an unforeseen or uncontrollable event. The appraiser assumes that the business needs to sell its assets within a short duration at an immediate auction. Targeted AuctionTargeted AuctionA targeted auction, also referred to as a controlled auction, is a type of auction that involves a small group of qualified buyers that compete during the acquisition of a company. The number of buyers is limited to about three (3) to ten (10), and it eliminates buyers that do not fit the criteria set by the seller.